Various maintenance tasks, small styling fixes and improvements were made for consistency. Fixed a styling issue with WPML language switcher when used with the main navigation. New: Mr. Tailor Extender plugin. Upon theme update a notification will suggest that the new plugin should be installed. The plugin improves compatibility with the upcoming Gutenberg WordPress editor, making the current page builder elements (Posts Grid, Sliders, etc) available as Gutenberg Blocks as well. 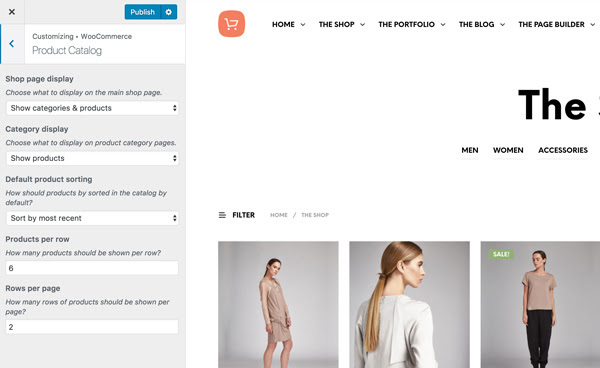 WooCommerce 3.3 introduces native options for setting up the number or rows and columns for the shop page. You may be used to find these under Appearance > Customize > Shop those were the theme options and in the latest version we’ve removed those to avoid duplicating what is now a WooCommerce core setting. You will find the new options under Appearance > Customize > WooCommerce > Product Catalog. WooCommerce 3.3 bring new image sizing settings and finally makes it much more easier to set up. The new settings can be found in Appearance > Customize > WooCommerce > Product Images. The best part is that we will no longer to have to use the “Regenerate Thumbnails” plugin when changing images size as this is done automatically in the background now by WooCommerce. This is a small maintenance update that covers various styling fixes and improvements for consistency and compatibility purposes across browsers and devices. Fixed hostgator specific installation issues. As usual, various styling fixes and improvements were made for consistency and compatibility purposes across browsers and devices. Right after updating the theme to version 1.6.13, you should see there's a new update available for the Get Bowtied Tools plugin, right under the Plugins section. The plugin was fully rewritten to make the installation and the maintenance of the theme easier. After updating the plugin, you'll get an error saying it was deactivated, and that's because it was fully rewritten and WordPress considers it a different plugin now. You just need to activate it and you're good to go. Watch a quick video walkthrough. A new version of Visual Composer was just made available. How to update? After updating the theme to 2.2.1, a notification will show up on your administration dashboard screen inviting you to install a new plugin called: Get Bowtied Tools. This is a small plugin that handles the automatic theme updates, your products key and the demo content installer. Part of making the theme lighter and faster was to move this back-end functionality outside the theme, into a plugin. So, just go ahead and install the plugin as well after updating the theme and stay worry free, nothing changes as far as you should be concerned as a site administrator. WooCommerce 2.6 is planned to be released on June 16, 2016. It's a major version change and with this update we're preparing the theme to be compatible with it. After the following update, estimated June 15 2016, the theme's package will no longer include the Slider Revolution plugin. We stopped using it as part of the theme's demo for more than 6 months now, due to its complexity. In the last year the plugin grew into something much bigger with different purposes that went beyond creating sliders and beside making the theme heavier we've also received negative feedback regarding its complexity. Fixes the styling for the error messages on the checkout page. This is not your average maintenance update. The long awaited Version 2.0 of Mr. Tailor is here, it is a major update and it brings 3 completely new demos and lots of new features you have been asking during 2015. Important: After updating the theme, don't forget to update the Visual Composer plugins as well, to update go to Mr. Tailor > Plugins. Not updating the plugin will result in a Fatal Error. Yet another maintenance update that makes available the new and improved Visual Composer (4.8). This new version features improved performance and better user interface. We're releasing a new update to make available the latest version of Visual Composer 4.3.7. We're providing a new update to make available the latest version of Revolution Slider and Visual Composer. There are no actual changes in the theme. Please remember that updating the theme won't update the two premium plugin automatically, you'll have to manually update both. We're releasing a new update to make available the latest version of Revolution slider which fixes an incompatibility issue with the newly released WordPress 4.3. experienced by some users. We're releasing a new theme update to accommodate the changes in the newly released WooCommerce 2.4+. Along with it, a new version of Slider Revolution is included (Version 5+) and as usual, we fixed a few bugs reported by users since the latest release. Fix: Custom color not working on the "Separator" element. Don't forget to backup before updating and remember to always test in a safe / staging environment before going live. WooCommerce 2.4 is an important update and you need to make sure 3rd party plugins you may be using were updated as well to work it it. We're providing a new update to make available the latest version of Visual Composer (4.6) which was just released on 2nd of July. Update the theme then make sure you manually update the plugin as well. This is a small update we're releasing to fix the outdated templates in the latest version of WooCommerce (2.3.10). We're releasing a new maintenance update to make available the latest versions of Slider Revolution (4.6.93) and Visual Composer (4.5.2) plus fixes on compatibility issues with WPML. This is small maintenance update that fixes the outdated template (cart-totals) in latest version of WooCommerce (2.3.6) and ensure compatibility with it. The Visual Composer's latest version (4.4.3) was also included in the theme's package. That's all folks! There is a new update ... and now you know too! Happy Valentine's day! Don't worry, this update won't add red falling hearts on your site. After the release of WooCommerce 2.3 on February 12, they have released another three small updates. 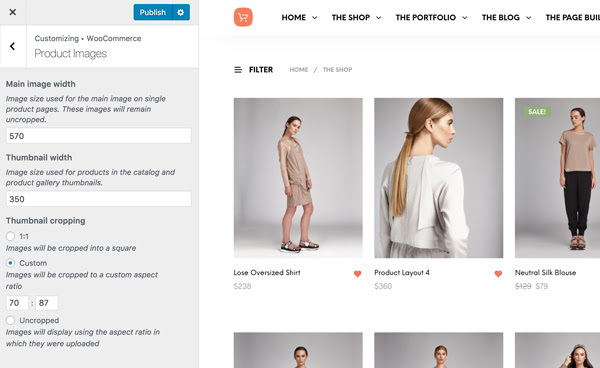 This theme update fixes the outdated WooCommerce templates and the Wishlist functionality. We're happy to announce a new theme update. Version 1.4.4 was released to ensure compatibility with the latest version of WooCommerce 2.3 codename Happy Hippo released on the same day. You can now choose to transform the blog into a masonry style grid of posts. The new layout can be enabled from the Theme Options panel. Check out the Blog section. We've implemented one of the most demanded features for the product page: zooming the image when hovering the product gallery. The feature can be enabled/disabled from the Theme Options panel. The ratings stars and the wishlist's heart icon are now included in the shop catalog. Users can now easily add products to the wishlist while browsing your site, without having go open up the products's page. The rating stars will help emphasize top rating products in the list. The elements allowing you to insert lists o products on custom pages can now be set up to be displayed as sliders/carousels. Visual Composer will release a new update soon (Version 4.4) and we wanted to make sure Mr. Tailor will be compatible with it. We did it now so we can safely update as soon as we can grab it. Just like we did on previous updates, we've been working this time as well on various small bug fixes, styling issues and improvements to help make Mr. Tailor as reliable as it gets. Version 1.4.2 is a small maintenance update that fixes a few small bugs from the latest version. New version for Slider Revolution - How to update Slider Revolution? Fix: The 'Sale' and 'Out of Stock' badges are now removed if the 'Catalog Mode' is enabled. Version 1.4 is a maintenance update, most of the changes won't be visible in the front-end but we've been working a lot to make performance improvements this time. Revolution Slider V 4.6.3 - How to update?